Zapier is a fantastic tool for filling in the gaps that naturally exist between various apps and services. 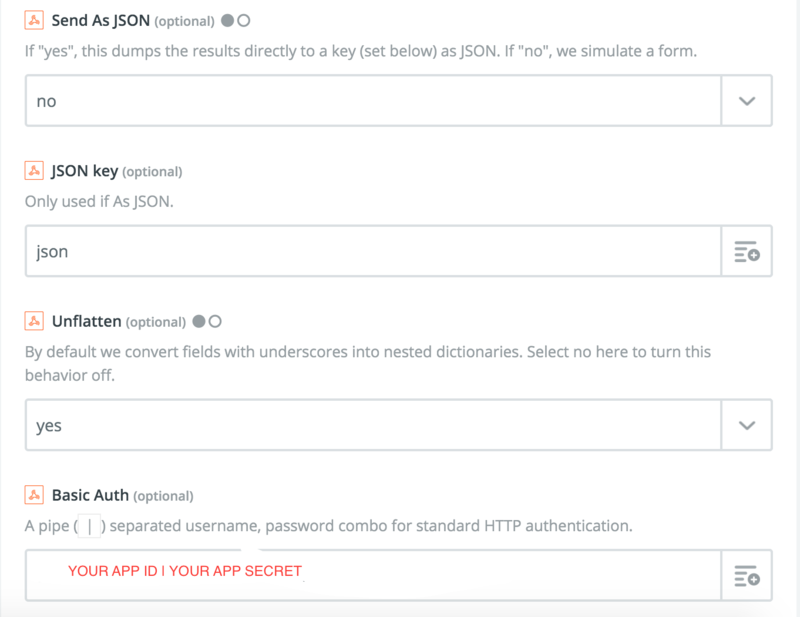 It comes equipped with some powerful utility features (such as webhooks, code injection, data formatting, email parsing, etc) that make it possible for developers to achieve even more robust integrations when the "click-to-config" integrations fall short. Recently, I was using Zapier to troubleshoot an issue that someone had reported, when I got inspired to find a cool use-case where Vinli and Zapier could work together. This post is the result. If you don't have a Zapier account, you can get one here for free. No worries, everything we do here will be available in the free version. Make sure you are registered in the Vinli Developer Portal and have a MyVinli account. We'll be doing a lot with Vinli CLI and Virtual Vinli. If you don't know what those are, or need a refresher, check out the blog posts that I've linked here. If you haven't already, create a an app in the Vinli Developer Portal. Make sure to set up a Web client, as you'll need a client to auth a MyVinli user. 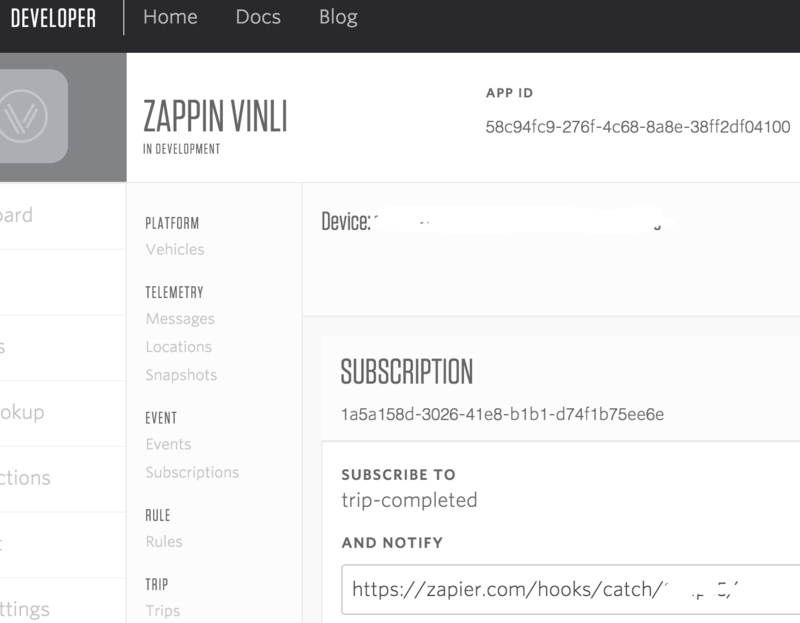 Make a new Zap in Zapier. For your trigger, you should select 'Webhooks by Zapier'. Then select the 'Catch Hook' option. Once you hit continue, Zapier will generate a custom webhook URL (it will look like this https://zapier.com/hooks/catch/2zabxz/). Create an event subscription for your dummy device (or whatever device you want to use). 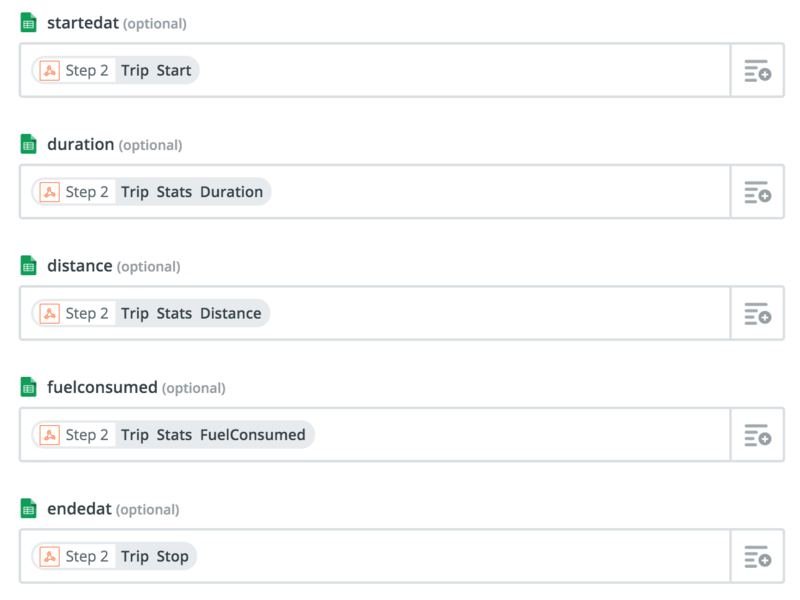 For this use-case, we're going to subscribe to the trip-completed event, that way we get a notification whenever the device completes a trip. Now navigate to the subscription in the Dev Portal. Our subscription will receive a notification anytime the device completes a trip. In order to give us some sample data to work with, let's send our dummy on a run. HINT: you might pick the dummy route for time's sake. Once your dummy finishes running the route, head back to the dev portal and reload the Notifications section of your Subscription. You should see a notification! Let's bounce back to Zapier. Remember when I told you not to test your catch hook? Now go ahead and test it. It should receive the notification from your dummy's completed trip. Now we're going to add another Action to our Zap. 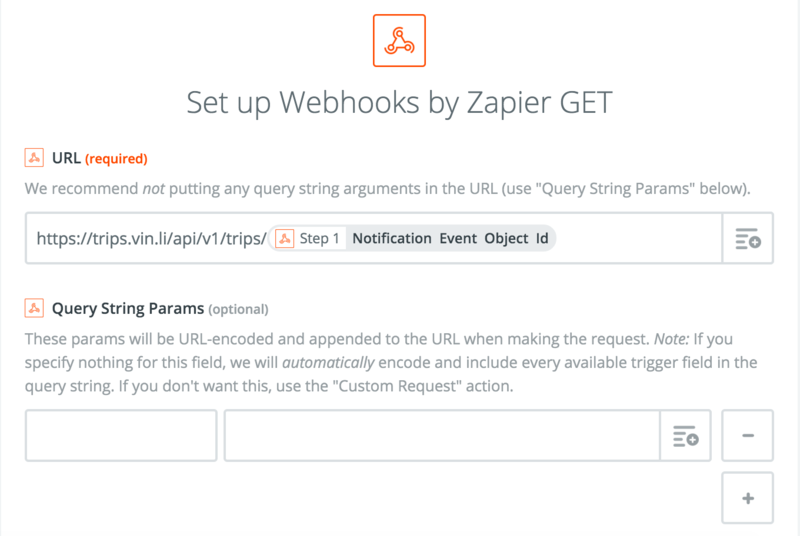 Choose Webhook's by Zapier again, and select the GET option. This GET request will take the trip Id from the notification and return the trip details. Hit continue, and test the step in Zapier. We're almost done! All we have to do now is set up our spreadsheet and map in our trip parameters. Now head over to Zapier and add an Action. Select the Google Sheets app. Select the 'Create Spreadsheet Row' action. Then map in the Trip parameters from Step 2. Send your dummy on another run just to test. Or, create a subscription for your real Vinli device and start logging those trips! !